October 13, 2017 – Do you have what it takes to think like a scientist? Well, put on your lab coats and thinking caps because NASA is challenging U.S. high school students to participate in research related to the International Space Station as part of its 2018 Drop Tower Challenge. 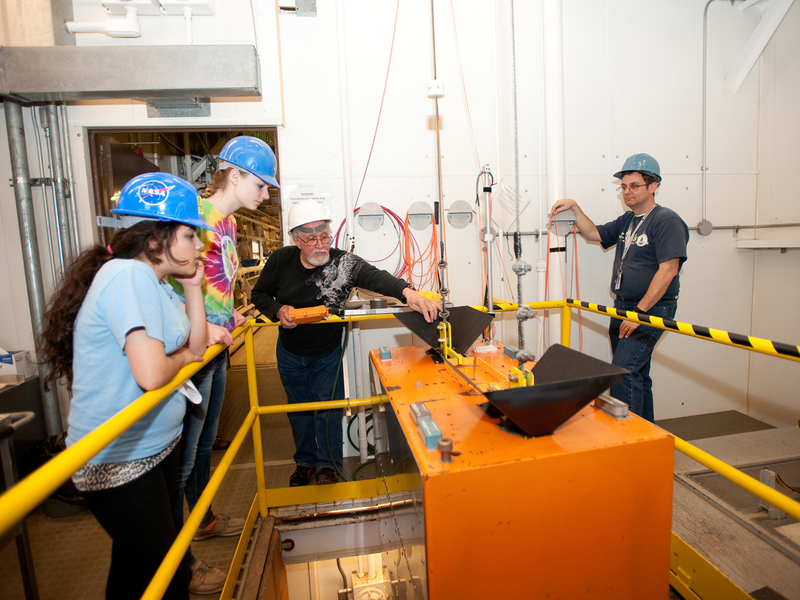 Students are asked to design and build objects that sink in water in normal gravity, but will be expelled as far as possible from the water during a free fall from NASA’s 2.2 Second Drop Tower at the Glenn Research Center in Cleveland. Using the agency’s drop tower, researchers from around the world study the effects of microgravity on physical phenomena such as combustion and fluid dynamics to develop technology for future space missions. To be eligible for the 2018 Drop Tower Challenge, the student-designed object’s expulsion from the water must result from the hydrophobic, or water fearing properties of its surface. The challenge involves a number of steps, including submitting written proposals to NASA for review before the agency selects final objects to test in the drop tower. During testing, objects will be put into vessels of water and dropped 79 feet in NASA’s drop tower. During the fall, objects and water will experience 2.2 seconds of apparent near weightlessness. The contest is open to students in ninth through 12th grades. Each team may submit one proposal and up to three objects for consideration. An organization (e.g. school, science center, scout troop) may submit no more than five proposals. No more than two proposals will be selected from a single organization. An object’s longest dimension may be no more than 60 mm and no less than 5 mm. This is a student-led project, however, students are allowed to get advice from adults and assistance in building their experiment hardware. Each team interested in joining the challenge must prepare a proposal with conceptual drawings and email it to ed-droptower@lists.nasa.gov on or before November 10, 2017. Proposals will be reviewed and finalists will be announced in December 2017. Finalists will send their team-built test objects to NASA for testing no later than February 10, 2018. Top-performing teams will have the opportunity to present their results during a student session at the 2018 meeting of the American Society for Gravitational and Space Research. The conference location will be identified at a future date. NASA anticipates selecting concepts from 10 teams local to the ASGSR conference site (within 150 miles) and 10 more teams from across the nation to test at NASA Glenn. When testing is completed, NASA will provide students with a video of their object’s test for analysis. Students will review the videos, and then submit a written report to NASA based on their findings by May 1, 2018. Challenge winners are expected be announced in May, and NASA will invite the winning team members to present a poster on their research at the ASGSR’s fall 2018 conference. Limited ASGSR funds are available to help support student travel. Questions and challenge submissions can be sent to ed-droptower@lists.nasa.gov.